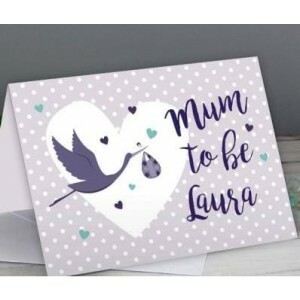 The card can be personalised with a name on the front up to 12 characters. The inside of the card can also be personalised with a message over 5 lines, with up to 20 characters per line. Our Mum to Be Stork Card is an ideal surprise for any expecting mother. The card can be personalised with a name on the front up to 12 characters. The inside of the card can also be personalised with a message over 5 lines, with up to 20 characters per line. For the NAME on the FRONT of the card - please note the name is case sensitive and will appear as entered. Please avoid entering the name in block capitals as this may result in your personalisation being difficult to read. The text on the INSIDE of the card will appear in upper case.